Blue Mountain Organics sent me some of their awesome products for review. 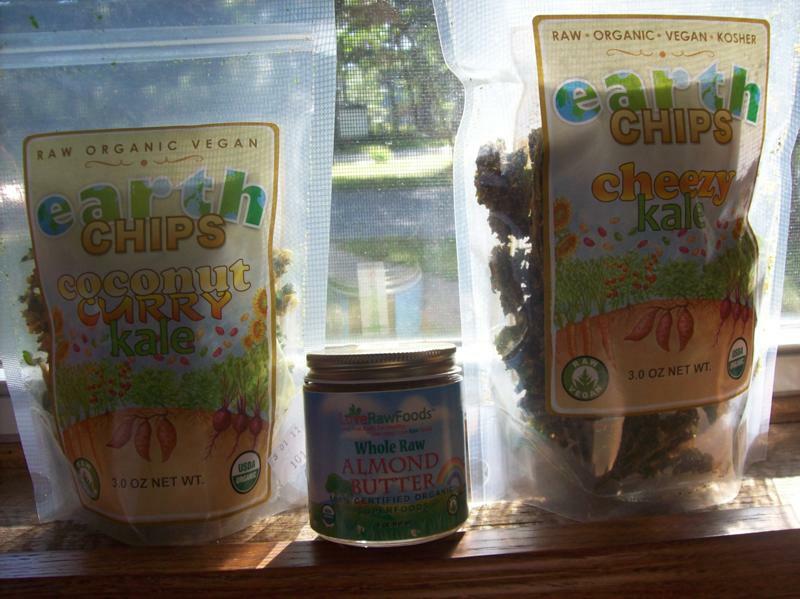 I got to try the Cheezy Kale Chips, Whole Raw Almond Butter, and the Coconut Curry Kale Chips. The almond butter is raw and vegan. It contains nothing but raw ground whole almonds. It is USDA certified organic. It is also 100% natural, wheat free, and gluten free. Oh yeah, and it tastes great! I would use this product on a nut butter and jelly sandwich or on a juicy crisp apple. Here is what the company has to say about the Earth Kale Chips: "Our vegetable earth chips are dried, never fried, bursting with taste and freshness. You will love the taste and the crunch, while you get plenty of vitamins A, C, K and minerals, such as iron, manganese and calcium. Indulge in green live food and guilt-free snacking. Eat your vegetables straight out of the bag, sprinkle the crumbs on your salads, garnish your stir fries, rice or soup. Your kids will love them too! Nothing artificial. No preservatives, fillers or additives. No oils. No trans fats. No GMOs. Gluten free. Enjoy our beneficial nutrient-dense super snack food!" The verdict on these babies: I love 'em! They are crispy, tasty, and best of all- super low in calories. They only have 35 calories/serving! Much better than regular chips. My favorite of the two was the Cheezy ones because the Coconut Curry flavor was a bit strong flavored. Where to Buy: These products can be purchased on the Blue Mountain Organics website! These kale chips are the best that are currently on the market! I highly recommend trying them! Hello there! I'm following you back from Tuesday. Aww!! Ava and Faith are adorable! Nom nom :0 they actually look quite yummy, and I don't even eat vegies!! I'm your newest follower! I've never had Kale chips but just recently a friend of mine told me that she made these at home. I couldn't believe it. I want to try them!!! THe chips sound delish!! THanks for sharing! First off, the turkey pesto wraps in the post below this one look sooo yummy! Second, I nominated you for the Life Is Good Blog Award! If you would like to learn more about how to accept it, visit this post.